I had seen this book around the blogosphere and I was quite intrigued so when I hit a reading slump I downloaded it and devoured it in a short amount of time. Our MC is Summer Stoltz, a college freshman who has been in love with her step-brother Kevin for years. When she goes off to the same college she thought things would be different between them but when she catches him in an awkward position she soon realises that her feelings are most certainly not reciprocated. Summer was a great character, she was a little lost navigating college life initially and her pining after Kevin was a little frustrating but she was a kind, quirky character that I came to adore. Summer literally runs in to Caden Banks, the anti-stepbrother and smexy as hell! Caden was an all-round nice guy, kind, caring and really sweet! I loved the way he looked out for and protected Summer, I also love the way they had a friendship first, they complimented each other well. His back-story was interesting and dealt with well. Kevin on the other hand wasn’t a likeable character, his hot and cold frustrated me as did his attitude, and I couldn’t see the appeal at all. There is a fair amount of drama In this book which I usually can’t stand at all but I didn’t mind this; we have unresolved family problems, a love that shouldn’t be and also one that should – there is heartache and pain but there are also sweet friendships, a blooming romance that was slow to build and a resolution that was believable and not instantaneous. 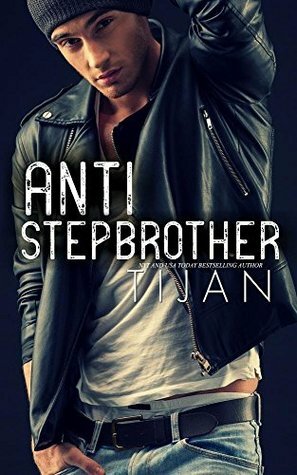 This was my first Tijan book and it won’t be my last, it was well written with an interesting storyline, I was initially hesitant because a step-brother possible romance isn’t for me but with a great cast of characters and an even pace with enough drama to keep things entertaining, I thoroughly enjoyed it. I've yet to read anything by Tijan but this one sounds really good. I've actually enjoyed the couple step-brother romances I've read so I might pick this one up. Plus I've had Carter Reed for ages and want to read that one, too. Sounds interesting. I haven't heard of this author before but I will definitely be keeping an eye out for this book. Anti-Stepbrother will bring you to a world of college drama, fraternity and brotherhood, where there are lies and betrayals but also where unexpected friendship and love may be found. It was a one wild roller coaster ride.